Several people have difficulty getting up from their beds after a relaxing sleep. Not having the best alarm clock can deal a serious blow to your body clock, not to mention your perfect attendance in school or work. Nowadays, there are many kinds of alarm clocks from digital or analog type to those which run around the room! 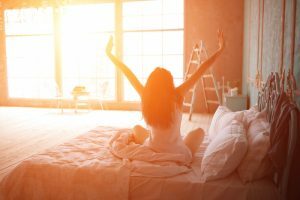 In this page, we’re going to help you choose the best alarm clocks so that you’ll always leave home bright and early, and at the right time. We’re also going to show you our top recommended alarm clocks in the Philippine market so be sure to check that out as well. In this segment, we’re going to introduce some reasons why it’s tough to get out of bed in the morning. We’re also going to cover some points on how you can improve your quality of sleep. Forgetting to set the alarm, nightlife, drinking too much alcohol, and exercising before going to bed – these are some of the many reasons for oversleeping. However, among the many reasons for oversleeping, perhaps one of the most common reasons is sleeping twice. Telling yourself to sleep “5 more minutes” is just asking for trouble. People go back to sleep after hitting the snooze button on their alarm clocks because sleep quality is poor. Improving the quality of sleep will give you more energy and minimize the risk of running to school or work in the morning. Start improving sleep quality by knowing your body clock. When there are several irregularities and stresses in life, the body’s sleeping rhythm can collapse. As a result, the body clock can act crazily as you won’t get enough sleep at night which would inevitably lead to difficulties in getting up in the morning. If you can’t wake up at the usual time in the morning, then you’re not going to sleep at the same time at night. This scenario will, in turn, cause you to have problems waking up in the morning thus starting a vicious cycle. It’s essential to get up at the same time each morning to properly adjust your body clock. You should also do the same thing when you have to sleep at night. Taking a lot of sunshine upon waking up is an effective way of preparing the body clock for the upcoming day. We’re already living digital lives which makes it tough to put away our smartphones and computers before we go to sleep at night. Light from these devices wakes your brain up and disturbs sleep. As such, once you’re already preparing for sleep, turn off all digital devices. Also, ensure that the room is dim so that your brain can become ready to sleep. To help narrow down your choices, we’ve prepared a list of the best alarm clocks to buy in the Philippines. We’ve already considered the best qualities for each alarm clock in this list. Make sure to read through the end to know which model is the right one for your needs. Alarm clocks differ in their sound volume. 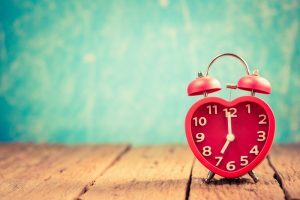 If the area is a crowded neighborhood, an apartment complex, or a very quiet place, then it might not be a good idea to choose a very loud alarm clock. Instead, choose a device that offers a light but audible sound (preferably with vibration). Or, some alarm clocks even have features to help people get up and about from their beds without sound. 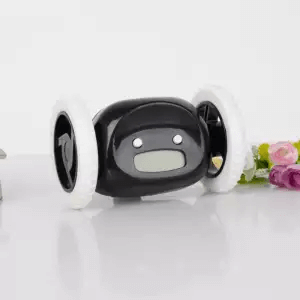 These functions include vibrating or even having wheels that make the device run around the room. Household owners might even want to choose a fun design or function for their alarm clocks if kids are going to use the device. Choose your best alarm clock according to where and by whom it is used. Alarm sound differs mostly based on the type of clock: digital or analog. Analog alarm clocks tend to have loud noises and vibrations that can wake up an entire household. 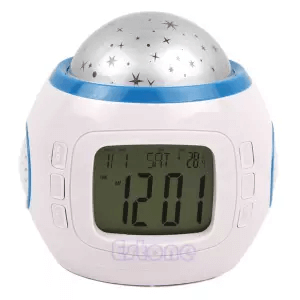 On the other hand, digital alarm clocks offer varying sounds like bells and even nature sounds. Choose the type that’s comfortable for you and the people in the area. If you don’t want to sleep twice, then choose an alarm clock with a difficult-to-stop snooze feature. 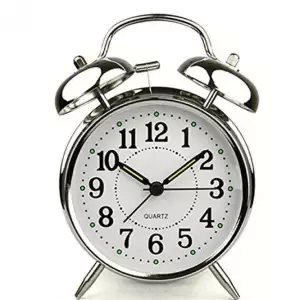 The common interval for the alarm to kick in once more after pressing the snooze button is 5 minutes. Some models allow users to set the interval of the alarm after pressing the snooze button. Aside from the snooze function, there are also some alarm clocks that make it difficult for people to stop the alarm to assure that you wake up bright, early, and brimming with energy. For instance, there are some devices that will move around the room once the alarm rings. In order not to go back to your bed, find a function that suits you. 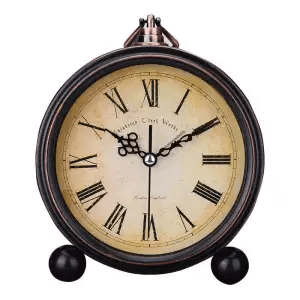 If you’re a fan of products with exquisite classic designs then this alarm clock should be a part of your home. It comes with a look that goes well with any home with a classic theme. It does have a silent quartz operation which makes it a perfect choice for students who like to study in complete silence while still keeping track of the current time. Alarm clocks let you wake up bright and early to greet the day, but this model also helps in giving you a blissful sleep. Aside from the optional nature sounds as its alarm audio, it also serves as a night light by beaming stars inside your room. However, the starry night light feature might not be for everyone, especially for people who want to sleep in complete darkness. Nonetheless, it’s a great choice for children of all ages, ideally for those who enjoy waking up under the stars. If you’re going for a contemporary yet simple design for your next alarm clock to go with the theme of your household, then this model is for you. It looks just like a simple wooden block without the number displayed, so it serves as a nice accent in your room whatever the theme of your room is. 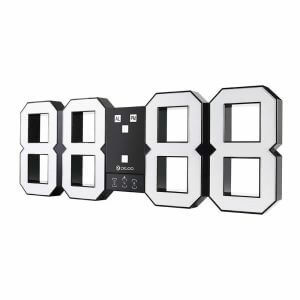 It even comes with different power options as you can supply power to the device by connecting it to a computer, a wall outlet, or by giving it batteries. 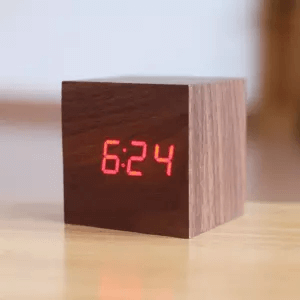 Choose this alarm clock if you’re a fan of devices with minimalist designs. It’s uncommon to see an alarm clock you can hang on your wall, but then you can get this model. This wall-slash-alarm-clock has an 8.46-inch length that might not fit small bedside tables. Aside from the bright LED to show the time, it also comes with an adjustable snooze function of up to 60 minutes of interval time. Setting it on the other side of the room will surely get you out of your bed! 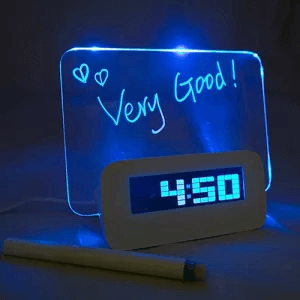 People need that daily dose of inspiration to get out of bed in the morning, and this alarm clock can be just the ticket for that purpose. It comes with a highlighter to write messages on the built-in luminescent board. Aside from the board, users can also choose from 16 different songs as the tone for the alarm. This device is also an excellent choice for people who tend to forget why they’ve set up an alarm right before they go to sleep. If hitting a snooze button on an alarm clock is too easy for you that you go back to sleep, then this is the device for you. 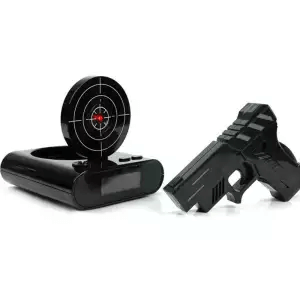 This model requires you to shoot once or five times (depending on the mode) to shut off the alarm. It can record sound, so you can use your favorite song as an alarm sound. It is highly recommended for children since they can enjoy getting out of their bed. It uses an infrared laser instead of bullets, so they can use it safely. Shutting off the alarm clock can be as easy as reaching for the device with your hand even while you’re still in bed, but that’s not the case with this product. Once the alarm goes off, it’s now your job to chase the device as it runs and jumps around the place. This playful approach to shutting off the alarm assures owners to wake up and move about instead of thinking (and attempting) to go back to sleep. As such, it’s a great choice for people who always say “5 more minutes” when they wake up. There are some people who can sleep through alarms without difficulty, but perhaps they haven’t heard the sound this model makes. This analog alarm clock clangs its bells like there’s no tomorrow, and the only way to shut it off is to flip the switch found behind it. Since the alarm is so loud, it’s not a good choice for crowded homes or neighborhoods. However, if you’re room has thick walls and you know you’re not going to bother anyone with this alarm clock, then this is the model for you. 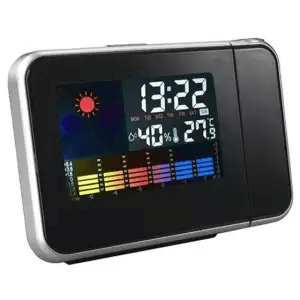 If you’re looking for a digital alarm clock that can do a lot in one package, then this is the model that you might be searching for all this time. It tells the time, weather, humidity, temperature, and date on a brightly lit LED display. It even comes with a projector to display the information on a wall for a better view of the data on the screen. Lastly, its crescendo alarm gets louder with time if no one pressed the snooze button yet. Now that you’ve reached the end of this page, you should have a clear idea on what alarm clock to buy and use. The best alarm clock should offer the right volume and features to help you wake up in the morning. Ensure that the alarm clock you choose will fit your specific needs. 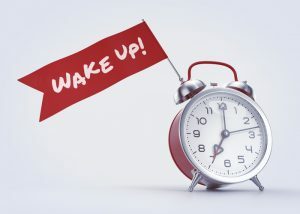 You can always bookmark and go back to this page if you still have difficulties in choosing the right alarm clock.